Wine Production in the U.S. is as old as colonial America itself. It is natural that when the first European settlers arrived they bought with them grape vines which were soon expertly grown in appropriate climates. Wine is grown across the United States, and not just in California, as one might be forgiven for thinking – California produces by far the most wine in all of America. Grapes were readily grown in the U.S. before the arrival of colonial settlers, leading the U.S. to be first dubbed ‘Vinland’ (land of vines), a point echoed in novelist Thomas Pynchon’s satirical look at the U.S. way of life called ‘Vineland’. It was soon discovered by settlers that none of the grapes grown in the U.S. were of the Vitis Vinifera variety (the variety that all wine is made from). 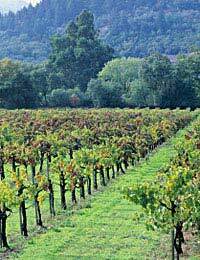 Consequently attempts were made to cultivate Vitis Vinifera in the U.S. Initial production resulted in fairly poor wines made from grapes that though of the Vitis Vinifera variety were not ideally suited to quality wine production. Gradual advances were made however, and Californian wines slowly improved up until the prohibition. Under the ‘prohibition’ the production and consumption of alcohol was banned (1920-1933). This had two results: It led to illicit drinking and spun a web of crime around the alcohol market, making it a much more dangerous substance than it had previously been, and it led to wide scale production of inferior drinks. It would take American wine a long time to recover from this. Whereas California was beginning to establish itself as a wine producing region prior to prohibition, after prohibition the state became known for poor dessert wines. Interestingly, whilst regional reputations are quick to suffer where poor wines are produced; it takes many years for a region to recover their reputation – even if they produce excellent wines. It was Andre Tchelistceff who from 1938 onwards was credited with having the foresight to develop quality European style wine making techniques in the U.S. This policy railed against the tendency of Americans to drink only cheap sweet wines. By the 1970’s U.S. wine had developed an outstanding reputation, sometimes beating European wines in International competitions. California is now one of the biggest quality wine producers worldwide, and one of the most familiar producers for U.K. supermarket shoppers. California tends to excel in the low to mid range market, producing good French style wines, often incorporating the noble grapes ‘Merlot’ and ‘Cabernet Sauvignon’. Not being French is actually one of California greatest advantages. Where the French would be loathe to mix certain grapes (Cabernet Sauvignon and Syrah, for example) the Californians have cut their reputation through wanton experimentation, producing some exceptional wines. This has involved novel blends, as well as pushing the limits of varietal wines: The Californian Syrah pushes this grapes spicy elements to the extreme. Besides California Washington and Oregon are the most noteworthy wine producing regions in the U.S, both of which produce high quality Burgundy style wines. Apart from Cabernet Sauvignon, Merlot and Syrah, Chardonnay, Riesling and Gerwurtztraminer are also grown effectively in the U.S.A. It is this mixture of adherence to popular old European grapes and producing methods, admixed with a willingness to experiment that characterises the bold and ambitious wines of North America.